How to Fix Mozilla Firefox Critical ERROR? Home »	Fix » How to Fix Mozilla Firefox Critical ERROR? Issue: How to Fix Mozilla Firefox Critical ERROR? For the last couple of days, I am getting a solid red screen alert on Mozilla Firefox, which says FIREFOX CRITICAL ERROR and says that someone tried to get access to my personal account. It also says that the data on my hard disk is in danger and that I have to call help desk to fix the problem. I ran a scan with Windows Defender, but it did not fix the problem. Please help!! Mozilla Firefox Critical ERROR is a red screen alert showing up on Mozilla Firefox web browser exceptionally. The emergence of this pop-up does not mean that the PC is targetted by hackers or that the system is infected with a Trojan horse. 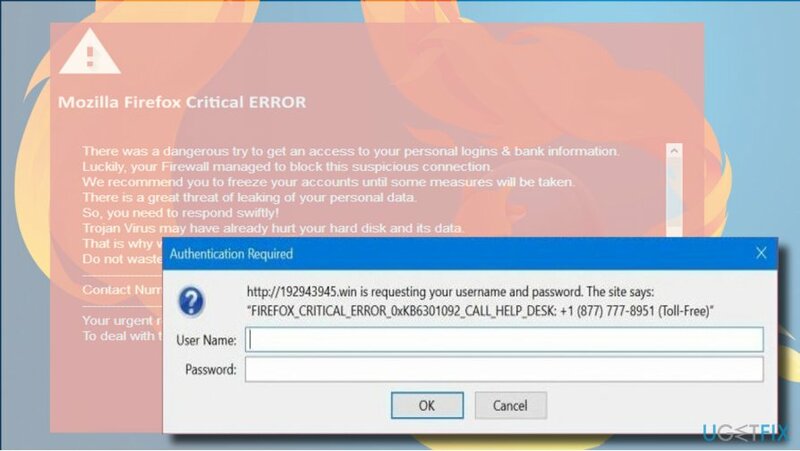 Mozilla Firefox Critical ERROR is a scam alert, which is distributed by cyber criminals who try to trick people into calling for tricksters and revealing their personal information or installing doubtful third-party apps. The emergence of Mozilla Firefox Critical ERROR scam requires one of the two conditions: the PC’s owner either access a compromised website infected with a malicious code or installs an adware. Once the malicious code is injected into Mozilla Firefox, the Mozilla Firefox Critical ERROR pop-up shows up and freezes the screen, so that the user can neither close the current tab nor the web browser itself. That’s one of the reasons why less experienced PC users fall into believing that the system is really in danger. The Mozilla Firefox Critical ERROR scam contains fictitious information. It reports an attempt to steal people’s personal information and claims that a Trojan horse has started compromising the information stored in a hard disk. On top of the red screen, people receive an Authentication Request pop-up, which indicates an error code (0xKB6301092, 0xKB1546764, 0xKB3078168 or others) and provides a technical support number. The Authentication Request pop-up asks for the username and password. That’s a tricky way to get access to personal people’s accounts. However, calling for the support is dangerous as well. The scammers on the other side of the handset employ psychological persuasion strategies and may trick gullible users into giving away their logins or allow hackers to connect to their PCs remotely. Therefore, it’s very important to ignore the information on the Mozilla_Firefox_Critical_ERROR_0xKB6301092 and fix your PC to prevent the pop-up from reoccurring. As we have already pointed out, the Mozilla Firefox Critical ERROR scam won’t let you to close the web browser by clicking on the X button. Therefore, to terminate the pop-up, press Ctrl + Alt + Delete and open Windows Task Manager. Find Mozilla Firefox on the list and click on it. Select End Task. Once Mozilla Firefox is closed, you’ll have to remove the Mozilla Firefox Critical ERROR adware. You can do that with a powerful anti-malware tool or manually by accessing Programs & Features. We would strongly recommend using Reimage. Check the date of recently installed programs and if it coincide with the emergence of the Mozilla_Firefox_Critical_ERROR, make sure to remove them all. Finally, don't forget to reset Mozilla Firefox. Otherwise, the pop-up will keep showing up. Open Mozilla Firefox and click on menu icon (three horizontal lines at the top right corner of the window). Type about:support in the address bar and press Enter to open Troubleshooting information page. Now click Refresh Firefox button and Refresh Firefox again on the confirmation window. Finally, click Finish and restart the browser. ^ Julie Splinters. Hackers' masterpiece – Zeus virus foisted among browser's search results. 2Spyware. 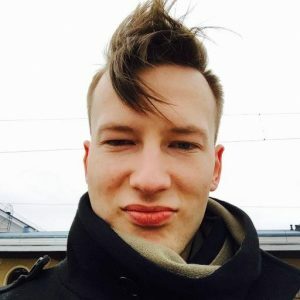 Quality information about malware and general security. ^ What you need to know about malware. Techadvisory. Technology Advice for Small Businesses. ^ Phone and internet scams proliferate. Mauinews. Online newspaper.